Behold the awesome power of water. Already the ocean is swallowing beaches, roads and anything else in the way of Hurricane Florence's monstrous storm surge. Storm surges aren't walls of water, like a tsunami, as commonly thought. Caused by a hurricane's winds pushing relentlessly on the shore, they are more like domes of high water that form as the ocean spreads inland. The high water has destructive waves on top, and it comes in addition to normal tides. Florence's storm surge will probably be 7 to 11 feet above ground in parts of North Carolina, according to the National Hurricane Center. Other areas can expect the surge to be taller than the average person — nearly 6 feet or higher. 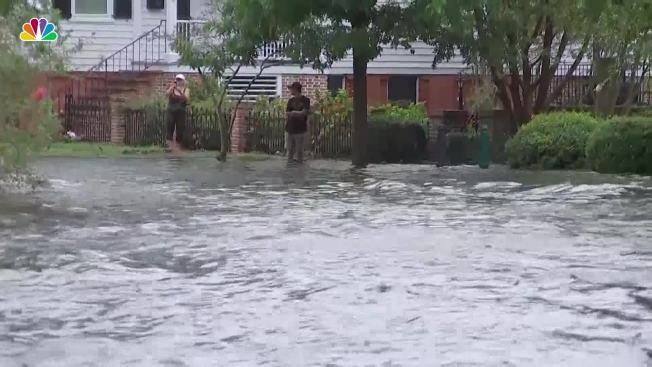 Hurricane Florence is expected to make landfall overnight, but the Carolina coast is already getting hit with intense winds and heavy rains as the storm approaches. Even if a house is elevated 10 feet, with that kind of storm surge, "there's a good chance there's going to be water inside of it," Needham said. Storm surge is higher in the right-front quadrant of a storm because the system's counterclockwise motion pushes more water inland, Masters said. Sometimes in the opposite quadrant there's a reverse storm surge that makes the ocean retreat. That's particularly dangerous because the ocean comes back quickly with 6 feet or more of water.